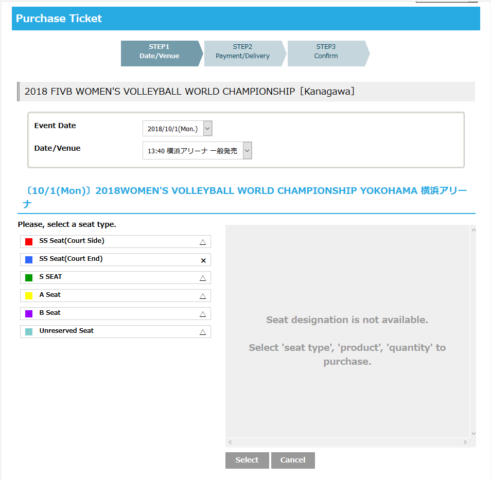 Tickets for the 2018 FIVB Volleyball Women’s World Championship in Japan have gone on sale today at 6 pm PDT (August 4th at 10 am in Japan). As we had mentioned in a previous article in July, the prices are fairly priced with many different price levels at all of the venues throughout the tournament. The Japanese Volleyball Association’s English twitter page even had a post to say that tickets were going on sale. When visiting the tickets page in English, which is provided by Rakuten Tickets, it is very easy to navigate. There are tabs for the different rounds and pools. 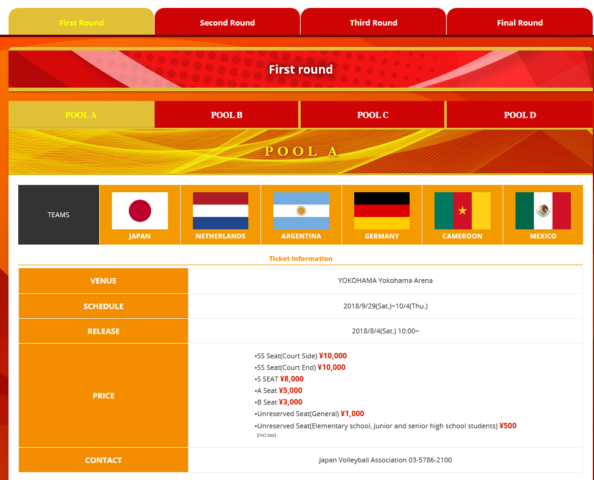 Each pool also lists the different ticket prices and a seating map at the bottom of the page. However, the page does breakdown each day’s and which matches you would be able to see with your purchase. So in the first round, you can see three matches for one price. By clicking the RED “click here” button, you are then taken to the seat selection page. Now you can see if tickets are available at which price ranges. If you see a △ or ◎ symbol, tickets are available for that seat type. The △ symbol means that there are fewer tickets than the ◎ symbol. If you see a ☓, then tickets are not available for that seat type. So I have chosen the A seat level. Now you can select how many tickets you would like to purchase at the 5,000 yen price. You have to pick Auto-Select because you cannot pick your individual seats, unlike those living in Japan. After clicking Auto-Select you will have 15 minutes to complete your purchase. Tickets for the World Championships can be paid for with Visa or MasterCard credit cards. After purchasing your tickets outside of Japan, you will receive a 13-digit exchange number which you need to take to a 7-11 store in Japan. The 7-11 store will print out your tickets for you and their fee is included in the final ticket price at the end of your purchase. Tickets for the semifinals on October 19th are already sold out on the English page but there are still some tickets for the 3rd place and Championship match on the 20th. Finals sold out in a hurry, but a lucky spectator in Japan could still score seats for third round, when the play will get intense. Should move fast on that. Nice work on this report. It’s a huge help for serious VB people to know in advance about tix. A couple days sooner might have helped those eager readers who live in or near Japan. A lot of buyers inside Japan no doubt hope their national team will reach finals. For those still wondering how to get in, keep an eye on Team Japan’s performance. 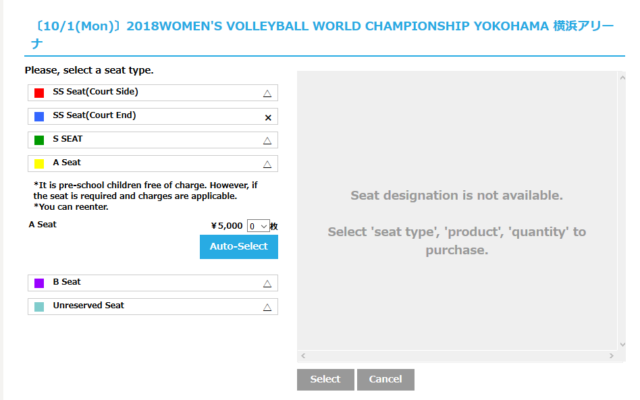 If Saori & Company don’t reach final four, you might find some tickets coming available — watch for ads on English-language sites. 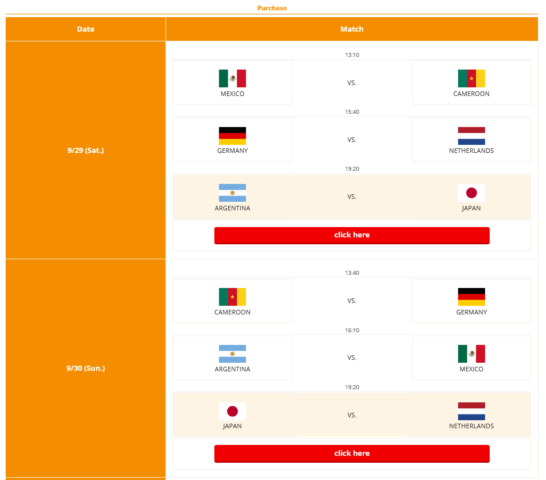 If they do reach final stage, the good news is you can watch matches on TV with your very excited Japanese friends. I purchased my tickets yesterday and of course being out of the country, there were some quirks that I found when trying to buy the tickets. I felt that an article to show how to purchase them would help those wanting to attend. With the tickets sales to those who live outside Japan (or even inside but using the English site) probably being limited for the most important matches, even getting tickets was a score. With the 1st, 2nd and 3rd round matches, there are still plenty of tickets available. If the FIVB could have put the semifinals and finals in a domed venue it would have done well. However, the finals would be during the end of the baseball season, so trying to get a large venue to be open even at this time is impossible. JVA went for known venues which are arenas. Saori Kimura retired after the 2017 indoor season and is very happy in retirement.